So now that you know a little bit about LinkedIn and you’ve built your personal profile, it’s helpful to play around with the site and explore all of the networking, job search, and professional development opportunities it has to offer. We’ve created a cheat sheet for you of some of (what we think are) the best and most helpful tools on LinkedIn for future professionals. Take a look! The Alumni Tool allows you to explore the profiles of alumni, helps you see what they are up to now, and what they’ve done in the past that has contributed to their success. 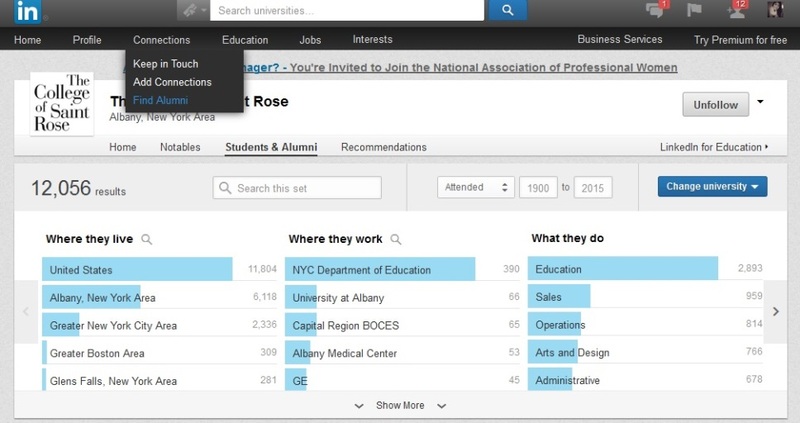 By selecting “Find Alumni” under the “Connections” tab, you’ll have access to every single person on LinkedIn that has The College of Saint Rose listed in their education. You can refine these results by selecting a region they are currently located in, a company they work for, or maybe even the major they studied during their time at Saint Rose. LinkedIn also allows you to connect directly with alumni from your school. We recommend that you consider sending a personalized message to introduce yourself and explain why you are looking to connect with them. Chances are your education and experiences in college dominate your LinkedIn profile. As college students and future professionals, that’s totally okay! It’s actually an advantage for you to add an abundance of information to your education, coursework, projects, and volunteer sections, especially when looking to network with alumni. While it may seem intimidating to “connect” with someone you may not know personally, alumni of the college are a great population to reach out to because you already have one thing in common and perhaps you may even have more similar experiences. The “Find Alumni” feature certainly makes it easy to break the ice and meet working professionals who got their start just like you! Under the “Jobs” tab, you will find postings for companies in your area. What’s even better about this feature is that it allows you to search for positions all over the world! The jobs page on LinkedIn has a search bar that allows you to search for a job title, keyword, or company name as well as the location where you’re looking to work. You can also visit the Student Jobs portal which connects you directly with entry-level opportunities, where you can review all listings or even narrow by industry, location, salary, etc. LinkedIn also has a function which allows you to save specific jobs, as well as targeted job searches to ease the job application/search process. Once you save a search, LinkedIn will notify you when any new jobs are posted that match your search criteria. Yes, you read that correctly- LinkedIn will literally deliver you job postings…what could be easier than that?! Have your eye on working for a prestigious company? Or maybe you’ve found a job posting for a smaller company, but want to know more about their values and or how they engage? “Company Search” is the tool for you! 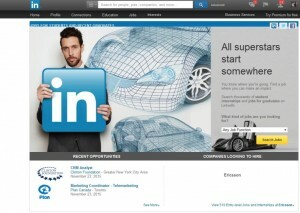 At the top of your LinkedIn homepage, you’ll find a search bar where you can type in people, jobs, companies, and more. Searching for a company using this tool is an excellent way to learn more about that company and what they do, as well as explore the profiles of their past and present employees and get a feel for their role as well! By choosing to “follow” a company, you will have access to all of their updates and even job postings. Company updates will show up on your homepage, but you can also go to the “Companies” page (in the “Interests” menu) for updates on the organizations that you follow. You can also use the company profile to connect with employees of the company and see how they progressed to their current role. If you decide to connect with someone you don’t know, be sure to send them a personalized message so they understand why you would like to connect with them. Try to convey in a succinct manner your career goals and let them know why you are looking for their professional advice! Groups are similar to companies in that they give you access to a lot of professionals in one place. Under the “Interests” tab, the Groups feature allows you to become a member of an online community in your industry, career field or professional group. Here you can ask questions, participate in discussions, and network with individuals working in those fields and other future professionals like you. Groups are one of the best ways to network on LinkedIn because they foster an open and encouraging environment where students seeking more advice and knowledge in a particular field can feel comfortable connecting and conversing with others. Groups are also a great way to hear about job opportunities specific to your field of interest. There are thousands of groups offered on LinkedIn, and if for some odd reason, what you’re looking for hasn’t been made into a group yet, you can create your own! 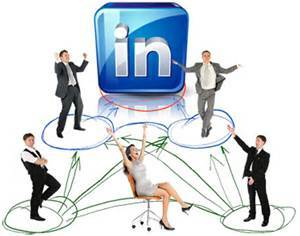 LinkedIn is not just changing the way we network and communicate with others. It is completely revolutionizing today’s job market and as students, we need to take advantage! Technology has had a presence in our lives since we were born, giving our generation a competitive edge when it comes to landing that first job. 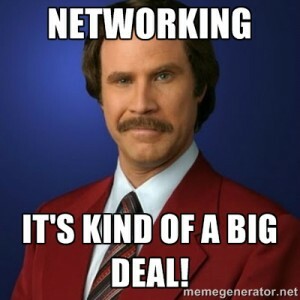 Get out there, be confident, and use these tools to establish some worthwhile connections!